I would love to see this corner finally get redeveloped but not at the expense of loosing Parkside. It's a great facility for the travelling exhibits and no where ot house them if its lost. There is no room in the new center. 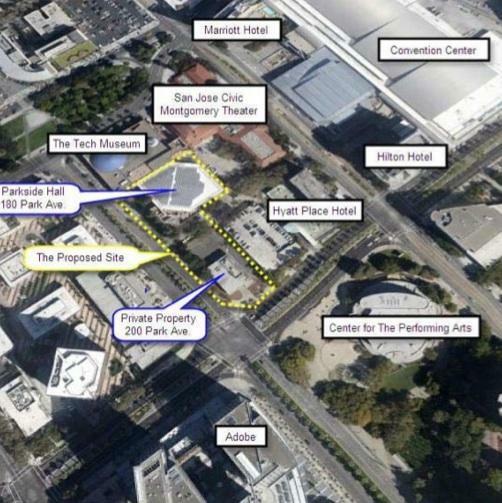 The space is used way to heavily as a Convention Center and would impact the large conventions the city gains. The exhibits don't fill hotel rooms, but it does bring people into downtown. The addition of a highrise with ground floor retail would be a big boom for the area. Maybe we could see a mixed/use building. Hotel/Apartments. We could use another few hundred hotel rooms close to the center. If they are able to get a hotel or hotel/residential combo (which would make perfect sense for this spot), there could still be a sizable space that could be used for exhibits. And way to (potentially) throw out the Tech's large solar array with the bath water there, team. Perhaps they could be re-installed on top of the convention center. Actually a big component of the deal is that the developer must build a new Parkside Hall. The highrise would be at the corner of Almaden & Park (200 Park Ave).